The UltraTAP® is the industry's most efficient controller for JTAG IEEE 1149.1 based test and configuration. It enables users to apply test and device configuration data to their PCB at high speeds using the IEEE 1149.1 protocol. UltraTAP's intelligent hardware architecture, called 'InstaTest', enables it to achieve actual throughput (the time to apply a vector, read the TDO and check for an error) at sustained speeds up to 64 Mbits per second. This technology, pioneered by Intellitech in 2000, with the Gemini 2000 has helped Intellitech customers improve productivity during prototype debug and bring-up by significantly lowering their test and on-board configuration times. The UltraTAP® uses US Patent #6,594,802 and world-wide patents-pending to provide the undisputed industry's fastest on-board FLASH programming. With the UltraTAP® FLASH devices can be programmed and verified on-board at speeds in excess of 1.5Megabits per second (Intel StrataFLASH 28F128K3C). Many vendors claim to support high test clock rates but their actual data throughput is limited by the amount of time it takes their software to determine failing/working bits. Intellitech's throughput does not stop at the PCB. The UltraTAP® throughput can be achieved regardless of the size of your PCB or multi-PCB System when used with Intellitech TEST-IP products. Routing TCK and TMS for operation above 20Mhz requires important design considerations. While some vendors may claim a 1149.1 POD speed of 50Mhz, they offer no additional on-board hardware such as scan-chain buffers and linkers that enable you to attain the higher speeds when the signals are routed on the UUT. Using the UltraTAP® and the Intellitech SRL, customers routinely run 40Mhz speeds on their PCB without impacting the design schedule to add buffers and voltage translators on board. 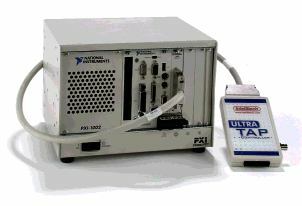 The UltraTAP® works seamlessly with all of Intellitech's IP and IC products for routing scan-chains and programming FLASH. UltraTAP® is available with industry standard interfaces for PCI, cPCI, PXI, TCP/IP Network and PCMCIA. The same UltraTAP® pod can be used in all four of these environments. Fast throughput is essential when using the IEEE 1149.1 test bus to configure large FPGAs or program FLASH memory. 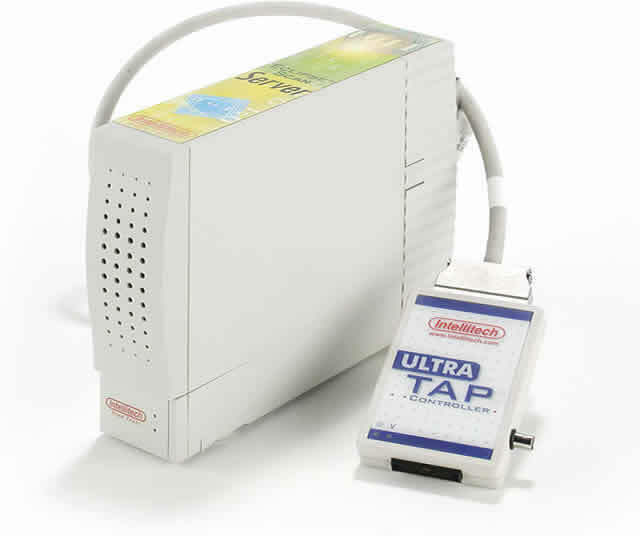 UltraTAP with Scan Server TCPIP/Ethernet Interface . UltraTAP is a registered trademark of Intellitech Corp.